Six Critically Endangered birds in five days! 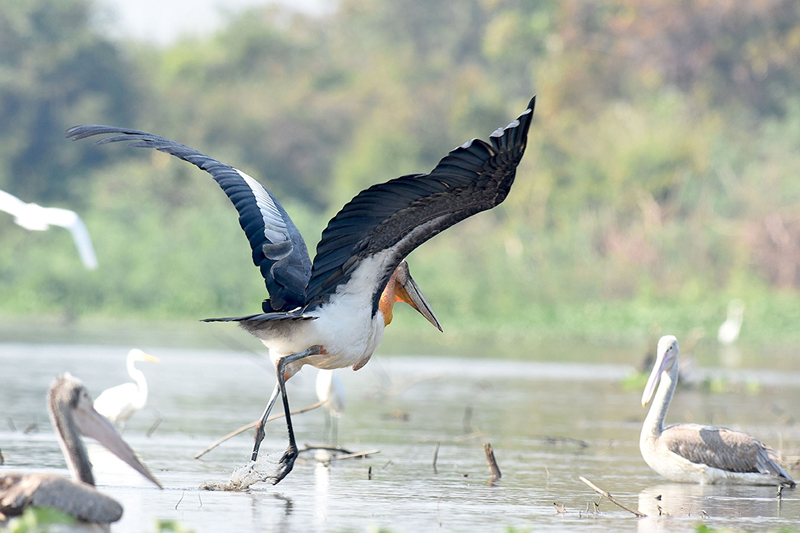 Cambodia is the last stronghold of a set of magnificent birds that are now so globally rare they are considered Critically Endangered on the IUCN Red List. This tour is a superb opportunity not just to see these incredible species, but by supporting SVCs work with community-based conservation, to give them the only chance of continued survival. Most of the birdwatching takes place in open dry forest, a beautiful habitat in which to bird. One night is spent in our large safari-style tents, with the other nights at a purpose-built community-eco-lodge. December – March, though different sites have somewhat differing seasonal highs for species and times can shift year on year. The Tonle Sap grasslands support over half of the world’s Bengal Floricans. Our guides have a very good track record of finding these Critically-Endangered birds, the first of the six targets, they should be seen within the first few hours of the trip. Whilst we are enjoying the floricans, other birds we typically see include Sarus Crane, storks, Manchurian Reed Warbler, Pied and Eastern Marsh Harrier, Small Buttonquail, Bluethroat and Red Avadavat. From here we will travel to the Tmatboey eco-lodge, birding in dry forest along the way. We may get a chance at our second Critically-Endangered species this evening, as we try to see White-shouldered Ibis at a roosting site. Night in the community run Tmatboey eco-lodge. At Tmatboey, SVC coordinates a scheme where the local people are paid to protect the nests of the two Critically Endangered ibis present – Giant and White-shouldered Ibis. Consequently our guides have a 100% record of finding these species for visiting birders! We will try to get good views of both species during the time we spend here. 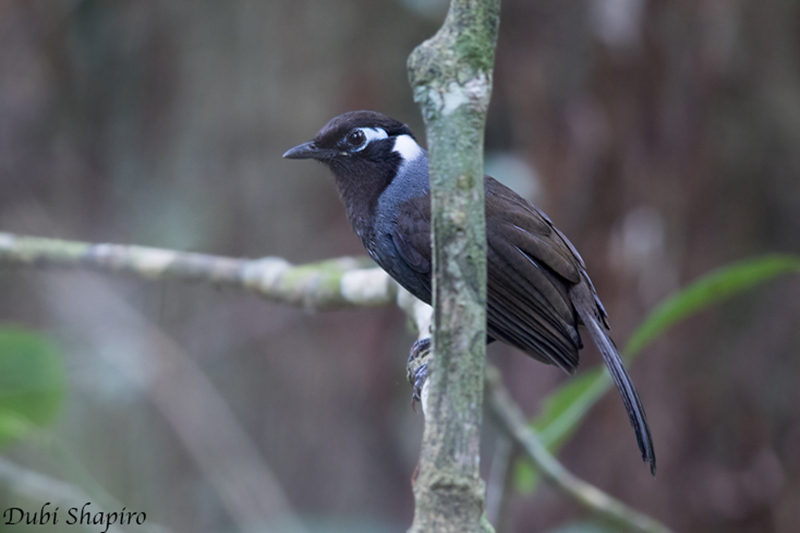 The birding is excellent and our guides, with the help of the SVC-trained local guides, have made a special effort to locate the day roosts of nocturnal species such as Spotted Wood Owl and Brown Fish Owl so you won’t lose sleep over seeing them. Tmatboey also supports an incredible 16 species of woodpecker including the fantastic Black-headed Woodpecker, the huge Great Slaty Woodpecker and the scarce Rufous-bellied Woodpecker. Our guides know where to find these and all of the dry forest specialties such as the recently recognized Indian Spotted Eagle, White-rumped Pygmy Falcon, Collared Falconet, Rufous-winged Buzzard, Indochinese Bushlark, Brown Prinia, Neglected Nuthatch and White-browed Fantail at this or nearby sites. There will be the chance to do some morning birding at Tmatboey, concentrating on anything that we have not already seen before we travel to Boeng Toal Vulture Restaurant. Our local guides will have already set up large safari-style tents for us to sleep in. The vultures will not be fed until the next day, so there will be time for some birding in the dry forest in the later afternoon and certain species may be easier to see here than at Tmatboey. As vulture populations have crashed across Asia, Cambodia has held onto populations of the three species currently considered Critically Endangered. However, owing to a decline in wild cattle populations, Cambodia’s vultures are now reliant on supplementary feeding. Joining this tour offsets the cost of running the ‘vulture restaurant’ and includes the local community in the efforts to save these impressive, macabre birds. 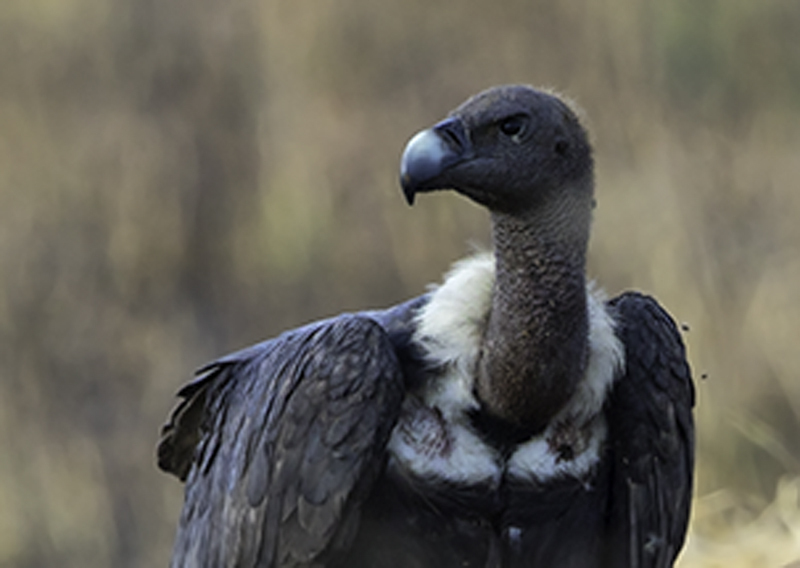 A dead cow will be provided to the vultures and from dawn we will be able to watch the spectacle of up to eighty White-rumped and Red-headed Vultures, and sometimes also Slender-billed Vultures feeding on the carcass. After the vultures have finished feeding we begin the four-hour return trip to Siem Reap. We will break the journey at Beng Melea, a spectacular jungle-temple ruin set in semi-evergreen forest providing a different assortment of birds. There is a chance of finding some scarce winter migrants from the Himalayas here, such as the difficult to see White-throated Rock-thrush.